In the past several months, we’ve added new discussion and commenting features to improve collaboration in Google documents. As an engineer, I often create docs with design concepts and send them to my team to review and provide feedback, and we use the commenting features to facilitate these discussions. Sometimes, I want to let team members view and make comments without allowing them to directly edit my document. Over the next several days, we're releasing a new sharing option so that you can let people view and add comments to your documents without giving them edit access. To give comment-only access to your document, click on the Share button. From there, add in the contact you’d like to share your document with, and select Can comment. You can also choose to give comment-only access to anyone with the link or anyone on the web by changing the sharing settings within the document. To do this, click Change in the sharing settings window and change visibility options to Public on the webor Anyone with the link, then change the access options to Can comment. 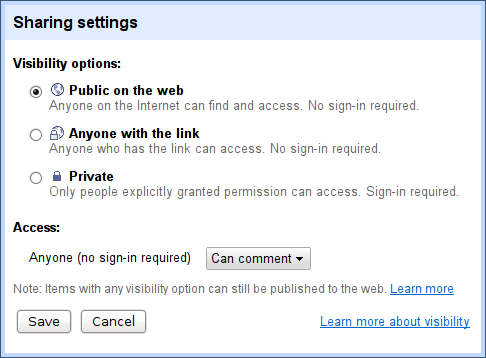 Similarly, if you’re using a Google Apps account, click Change in the sharing settings and select either “People at who have the link can access” or “People at can find and access.” Then change access option to Can comment. 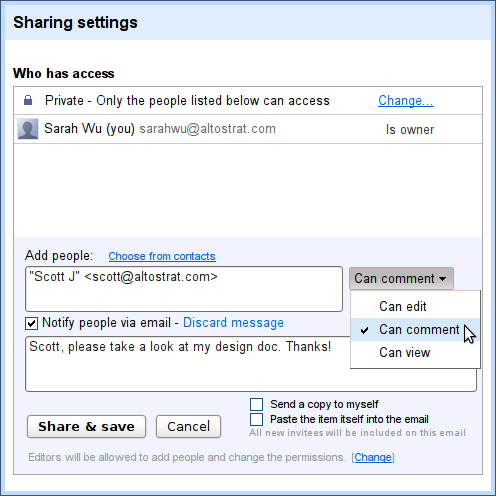 Users that have comment-only access can view your document and add comments throughout -- without being able to change the content of the document directly. We hope this latest feature in discussions helps you get the feedback you need while providing you with more control over the content in your docs.